In this week’s edition of Industry Perspectives, Schneider Electric’s Mark Feasel discusses what is in store for the energy industry in 2018. Mark Feasel, VP, Electric Utility and Smart Grid at Schneider Electric. Last year was a formative year for the new energy landscape. It underlined new challenges for operations, sustainability and financial decision-makers, while introducing innovative opportunities and advancements. In 2017, we saw how severe weather events, aging infrastructure and cybersecurity threats continued to illustrate the fragility of the existing centralized electric distribution system. At the same time, GTM Research reports that 2017 saw a significant increase in microgrid projects and mixed or third-party ownership business model structures in efforts to increase power resiliency and efficiency. As we look at the year ahead, we can expect to see several trends continue, as well new customer tendencies developing with historically passive consumers taking on more proactive roles and exploring different business models to best meet their operational needs. As I see it, the most obvious, and likely most prevalent, is the continued rise of the “3Ds”. By 2020, we will incrementally connect 10 times more devices than people, and the resultant increase in data will further demystify energy for all stakeholders. Due to the increase in both data volume and velocity, 2017 saw a sharp rise in machine learning and analytics in the energy field. Furthermore, Software-as-a-Service (SaaS) platforms now allow us to apply this technology to a much wider range of consumers. Artificial intelligence is forecasting weather patterns and its associated impact upon the output of renewable energy sources, load levels and power quality. When paired with operational analytics on distributed energy resources, microgrids can be optimized to facilitate increased renewable energy penetration and higher utilization of assets, therefore, delivering better sustainability and more predictable costs to consumers. The decentralization of energy production, desire for decarbonization and rise of digital assets have changed the dynamics of energy generation. The decentralization of energy production, desire for decarbonization and rise of digital assets have changed the dynamics of energy generation. In response, the growth of distributed resources will continue to skyrocket in the energy industry in 2018 and beyond, and consumers and utilities alike will seek to build smarter, cleaner energy infrastructure and maximize the use of DERs using advanced microgrid technology. With the expansion of the microgrid market outside of high resilience applications and an increasing desire of consumers to incorporate renewable energy, 2017 saw the first big wave of hardware and software launched specifically for microgrids. Their design and delivery have also become less bespoke, targeted to commercial, industrial and institutional markets. According to a 2017 study by Navigant, the cost of implementing a 2N power architecture doubles the total cost of ownership of the system over a ten-year period, with most of the costs coming from operations and maintenance (not the incremental mechanical and electrical equipment). The design premise of these newly launched microgrid solutions facilitates configuration instead of engineering. Furthermore, they are modular enough to be prescribed for specific pockets of load, instead of whole facilities. Software at the grid edge and in the cloud allows us to harmonize these smaller zones to meet consumer business objectives at a lower cost than building a microgrid capable of serving all load equally. In this manner, we can significantly reduce the premium to drive resilience. As data demystifies energy, consumers have better visibility into how the energy that they procure from the centralized grid is not perfectly aligned to their business objectives. This lack of alignment represents inefficiency that organizations want to eliminate, and both supply and demand side solutions will enter the mainstream in 2018 to address this dynamic. To maximize sustainability and improve the predictability of costs, enterprises will continue to have a hearty appetite for grid-scale renewable energy – acquired through purchase power agreements and other mechanisms. To address resilience, the best options are generally behind the meter; however, implementing the DER and facility upgrades to drive resilience can be complex problem. Regulation and incentives are in flux, technology is evolving quickly, and maintaining a stable operations and maintenance budget is a struggle for many companies. 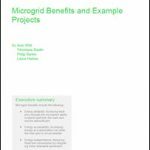 Microgrid as a Service (MaaS) emerged in 2017 to address this challenge. In the MaaS model, companies across the entire spectrum of energy – design, build, own, operate, optimize and maintain – come together to mitigate these risks on behalf of consumers, delivering cost, sustainability and resilience benefits to consumers without requiring capital or operations and maintenance budgets and protecting from both technical and regulatory risk. For the energy industry in 2018, companies need to prepare to be an active energy participant, putting the pieces in place to produce energy and interact with the grid, utilities, peers and other new entrants. Those that fail to act now will be left behind to face the consequences of a more expensive, less sustainable, increasingly fragile grid. Mark Feasel is vice president, electric utility and smart grid at Schneider Electric.